Cassava Cake with Custard Topping made with grated cassava and coconut milk. 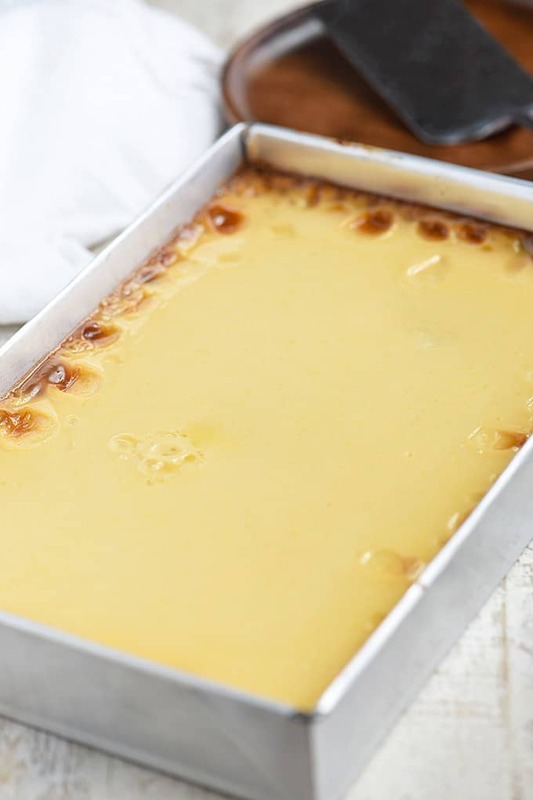 Soft and moist with a creamy flan topping, this classic Filipino treat is the ultimate snack or dessert. And it’s naturally gluten-free, too! As a Filipino in the U.S. without complete access to indigenous ingredients, I, at times, have to make substitutions when recreating the Filipino dishes I grew up with. 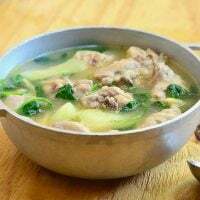 A good example would be my chicken tinola and ginisang munggo with chicharon; I usually use spinach leaves because the traditional malunggay or ampalaya leaves are not always easy to find even at Asian supermarkets. These later years, however, have seen a considerable variety of Filipino food products now being imported and made available for us Filipino-American consumers. On most occasions, I have to forgo of “freshness” as these items come pre-packaged or frozen, but the convenience and time-saving elements are tradeoffs I don’t entirely mind. 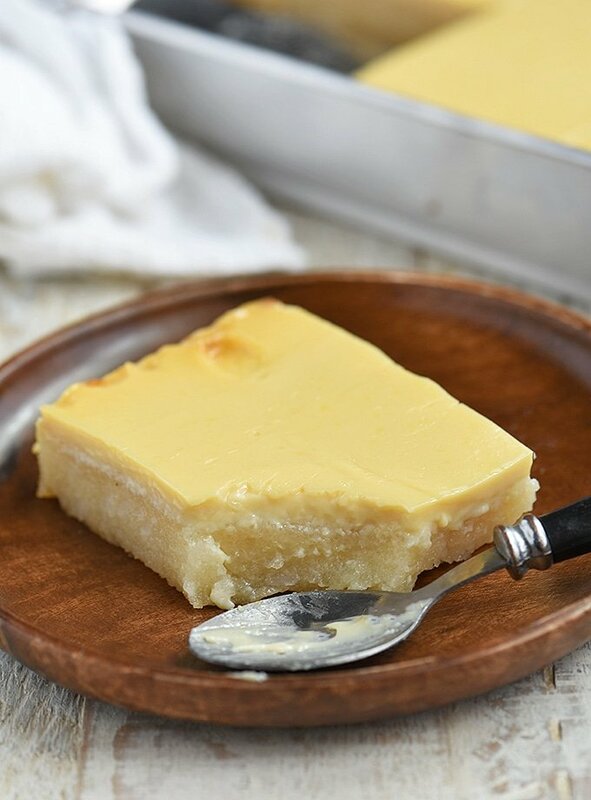 If I have to peel and grate cassava roots, crack and milk coconut heads myself, I’d just as soon forget about making this cassava cake with custard topping. But by just heading to the freezer section for already-grated cassava and walking down the aisle for canned coconut milk, I can have it baking to sweet perfection in the oven in a matter of minutes. 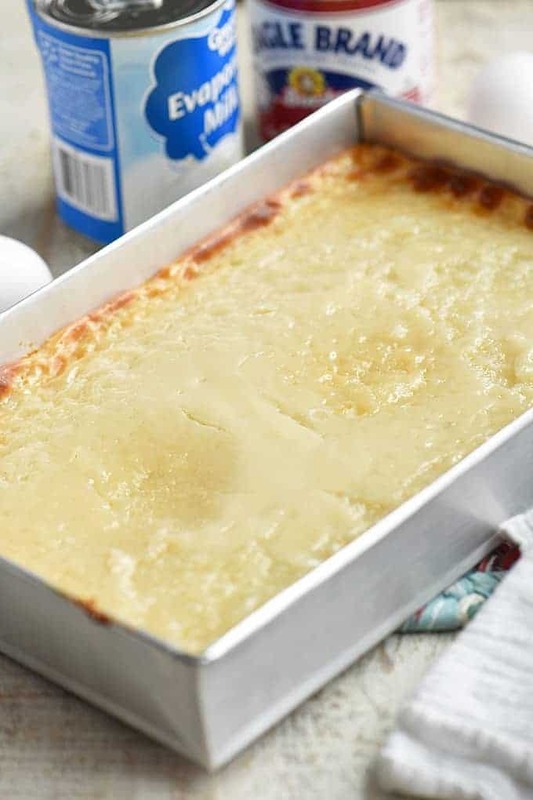 Cassava cake in its basic form is made of grated cassava, coconut milk, and sugar which are combined into a batter, and then baked in the oven until set. 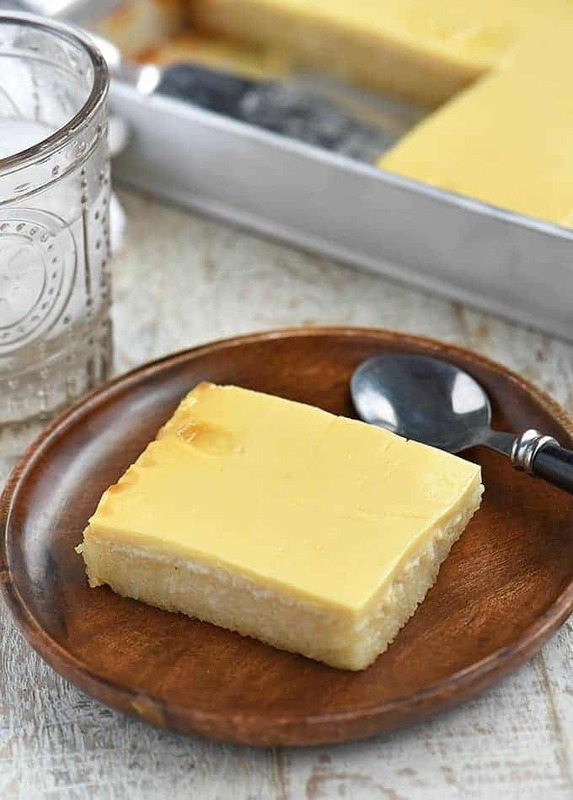 The cooked cake is usually crowned with a choice of topping, ranging from a simple sprinkling of shredded cheese to a more elaborate custard made with eggs, condensed milk, and evaporated or coconut milk, and then baked a second time until golden. As with most dishes, the recipe may vary depending on the cook and may include other additions to the batter mixture such as sweetened macapuno strips, young coconut meat, desiccated coconut, nata de coco or cheese. Depending on the length, you might need to cut the tuber crosswise into halves or thirds to make peeling more manageable. With a sharp paring knife, slice the tuber lengthwise through the thick bark and carefully insert the thin end of the knife between the bark and the flesh to loosen. If the skin won’t peel easily, cut off the ends of the tuber and stand the root up on its end. With the knife, slice vertically down the sides of the root to peel the skin. Wash thoroughly and soak in a bowl of water until ready to grate to keep from discoloring. Grate the cassava using the small holes of a grater or run in a food processor into a fine texture. Using a cheesecloth, squeeze the grated cassava of the liquid which could be bitter. Please note that I use frozen cassava which I don’t drain when thawed; if using fresh, moisten with about 1/4 cup of water to yield the soft, moist texture of this recipe. If using frozen grated cassava, thaw completely but DO NOT drain. If using freshly grated, which is usually squeezed dry, add about 1/4 cup water to moisten it. The recipe requires 16 ounces or two cups. I use a baking pan I bought in the Philippines which is 9 x 6-inches in size. If using a less-wide pan, adjust the cooking time as the cake will be thicker. Insert a toothpick in the center; if it comes out clean the cake is ready to top for the second baking. Aside from a few dark spots at the edges, you can see that the cake is mostly even in color. Make sure to use a light colored baking pan, so the bottom of the kalamay doesn’t darken too much through the twice-bake process. If the cake or the custard is browning too fast before fully set, tent with foil. Do not cover the cake until fully cooled as the escaping steam will cause water puddles to pool on top. Leftovers should keep in the fridge for up to 3 days. Cover tightly with plastic film to lock in freshness. I first published this recipe in June 2013 and am updating it today with new photos and tips. I also modified the recipe and halved the ingredients to fit one pan (the previous measurements were for two pans). Make this cassava cake today! I know taste is subjective and bragging is not allowed on the blog 🙂 but I have to say, this is one of, if not the best cassavang kalamay you’ll ever try. I used to sell it along with mini egg pies, and they were both my bestsellers! The cassava layer is soft, moist, and delicious on its own but the flan topping takes it over the top. It’s like having two desserts in one bite! Looking for more ways to cook kamoteng kahoy? Check out this cassavang suman, puto lanson, nilupak, and pichi-pichi recipes and enjoy! Cassava Cake with Custard Topping made with grated cassava and coconut milk. Soft and moist with a creamy flan topping, this classic Filipino treat is the ultimate snack or dessert. And it's naturally gluten-free, too! Brush bottom and all sides of a 9 x 6 baking pan. Set aside. In a large bowl, combine grated cassava, macapuno strings, coconut milk, condensed milk, and sugar. Stir well. If using freshly grated cassava which is usually squeezed dry, add 1/4 cup of water to the mixture. Pour cassava mixture into the prepared baking pan and bake in a 375 F oven for about 45 minutes to 1 hour or until a toothpick inserted in the middle comes out clean; if the cake is browning too much, tent with foil. Meanwhile, In a bowl, combine custard ingredients: egg yolks, 7 ounces sweetened condensed milk, and 6 ounces evaporated milk. Stir until well-blended and strain using a fine-mesh sieve. Remove the cake from the oven and carefully pour custard topping mixture over the surface to cover entirely. Return to the oven and continue to bake for about 15 to 20 minutes until a toothpick inserted in the center of the flan comes out clean; if the top is browning too much, loosely tent with foil. Remove the cassava cake from the oven and allow to cool before slicing into servings. This recipe yields one 9 x 6 and one 6 x 6 baking pans. Thank you, Bernadette. I hope you enjoy it! Happy holidays! May again. Everytime I cook this, it seems that the custard mixture is not covering well the cassava itself. To add more of the custard topping, if I add 2 more egg yolks, ilang kaya ang i-add ko na condensada at evap milk. Hi mam. Just wondering.. no eggs in the mixture? Im browsing a lot of recipes for cassava cake and they usually have eggs in them.. just for clarification.. thanks! No eggs in the cassava mixture, just in the custard topping. The cassava is sticky enough and will hold together without the eggs. Very excited to make this! Thank you for making it easy! 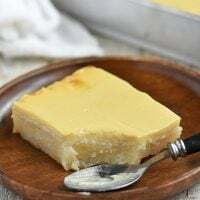 I won’t recommend keeping this cassava cake at room temperature for more than 3 to 4 hours especially during Summer time when wearher is very hot. It has coconut milk and it will spoil fast. In the refrigerator, it will be good for about 3 to 4 days, just make sure to cover it tightly so it doesn’t dry out. I’ve never had enough leftovers to actually try freezing it but I think it will keep well for about a month in an airtight container. Thaw out overnight in the refrigerator and then warm up in the microwave for a few seconds and it should be good to enjoy again. Thanks for your prompt response and suggestions. You are awesome! Can I use tapioca powder instead of grated cassava? What will be the measurement and texture? I am sorry, I’ve never tried this with tapioca powder so I wouldn’t know measurements and how it would turn out. I am assuming texture will be very different as your working with powder form instead of grated. hi chef what if iam going to use fresh casava? what is the measutement? I included tips on how to use fresh cassava in the post. 🙂 You’d need about 16 ounces or 2 cups grated cassava plus about 2 to 3 tablespoons water added to the batter. Hi po, pwede po kayang cassava flour ang gamitin instead of grated cassava? Mahirap po kasing hanapin ang grated cassava dito sa amin. Unfortunately, I’ve never tried using cassava flour so I can’t vouch for the results. Fresh tubers are not available in your area? i wanted to try this using muffin pan. any suggestion as to the time in the oven? Decrease the time maybe about 10 to 15 minutes as muffins are smaller and will cook faster. I’ve never done this in a muffin pan before (great idea-perfect for parties!) but just insert a toothpick in the center to check for doneness. I rarely give feedback, but I must thank you for sharing your recipe. 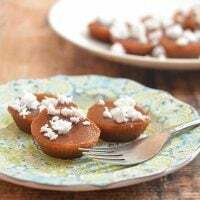 I am a novice in the kitchen and was so nervous to make your recipe that I forgot the sugar! Nevertheless, I brought it to work and everyone still liked it. They even asked for the recipe as well. Thank you! I can finally bring something in our work and church potluck! This looks beautiful, and I would like to try it. Do you have to thaw the frozen cassava before cooking? If so, do you strain out or squeeze out the liquid after defrosting? Saan po nakakabili ng ganito??? Thank you for this delicious recipe. Everybody enjoy my first try. On my 2nd try medyo matigas ang cassava cake and nagseseparate ang toppings when I slice it. Just like to ask what will I do to make the cassava cake softer and hindi humihiwalay ang toppings sa cassava cake? Also another question, if I use grated fresh cassava, is it the same measurement as the one you use, 14,ounces per packaging? Thanks. From my experience, ver soft itong cassava cake na ito. I think baka overcook na siya when you add the custard topping kaya humihiwalay yung topping. Pag hindi na siya basa sa top, pwede na add yung topping for the second baking. 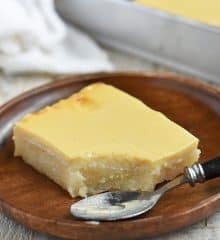 The best cassava cake recipe with custard topping!!! I be tried many but this is the best and I made it a hundred times for potluck and parties. Thank you for the recipe. Can we make this too in small size cups for puto and kutsinta making? can i use the 13 x 9 x 2 inches pan? or perhaps the regular aluminun pan which is like 10.5 x 8 x 2 ? or i have a dish pan 11.5 x 9.
i’m also making your malagkit na bibingka for my friend. Thank you for your cassava cake recipe. I made one today and all four kids of mine loved it including the one who does not like sweets.. I am trying your other recipes, they are easy to follow especially for moms like me who do not spend much time in the kitchen. Will be looking forward to other recipes that you’ll post in the future. God bless you..
G’day! Wanna know if I need to strain the macapuno first or just tip the whole content (syrup & macapuno) to the mix? Thank you in advance for your help. How can I make these into mini cakes in a 12-cup mini cheesecake pan? 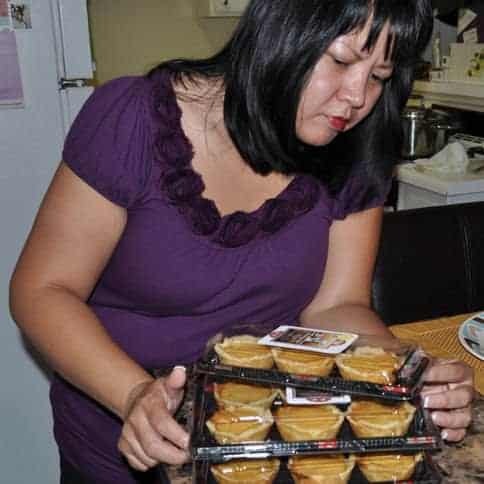 the other day i went to a latino market here in new zealand, and i found that Jamaicans do make casava cakes too, i read their recipe but its slightly diffirent from our philippine casava cake , i did not taste their cake but i have the feeling that pinoy casava cake is so much better. 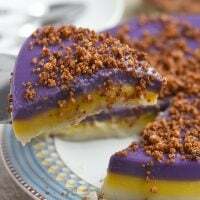 but due to seeing the jamaican casava cake, now im craving for the pinoy casava cake, I’ll be hitting the Asian stores today to check if they have the frozen casava. To those who are afraid of casava poisoning, when you use fresh casava and grate it your self, Place the grated casava in a cheese cloth or even clean t-shirt and gently squeze out the water and discard. You might need an extra cup of coconut milk or milk though. Thats how we do it back in quezon Province. Hi Ms. Lalaine! Is it okay if I’m gonna use only a half of all the ingredients? I mean just 1 pack of cassava, 1 can condensed milk, 1 can coconut milk and etc. I just want to make a 1 tray for it, if that’s okay and if it will not affect the texture of the cassava cake? Thank you. it’s a while now since i’ve been trying sime pf your recipe’s and everytime it was a hit not only for my family but to my friends. cassacake cake was a blast! even my sister in NY ask for your recipe even she didn’t taste it yet she said it really looks delicious. Hi Ms. Elaine….I am so eager to try this in the future, actually I keep on opening your website because all your recipes seems to be so delicious and easy to make…By the way, is there a frozen grated cassava here in the Philippines? is it available in some supermarkets or groceries here? Thanks! Hi Ms. Lalaine.. Just want to know lang po if those 2 cans of condensed and coconut milk will used all in cassava mixture? then separate po ung sa toppings? so total for 3 condensed milk in recipe? tama po ba? Yes, 2 cans of coconut milk and 2 cans of condensed dun sa cassava. Another can of condensed milk to combine with 1 can of evaporated milk to use as topping. Will try your mini egg pie. . hope maging successful din.. Try ko din po yung macaroons pero wala po ako makita desiccated coconut. . panu po kaya un? How about unsweetened coconut flakes? Pareho lang sila naman mas fine lang yung desiccated. 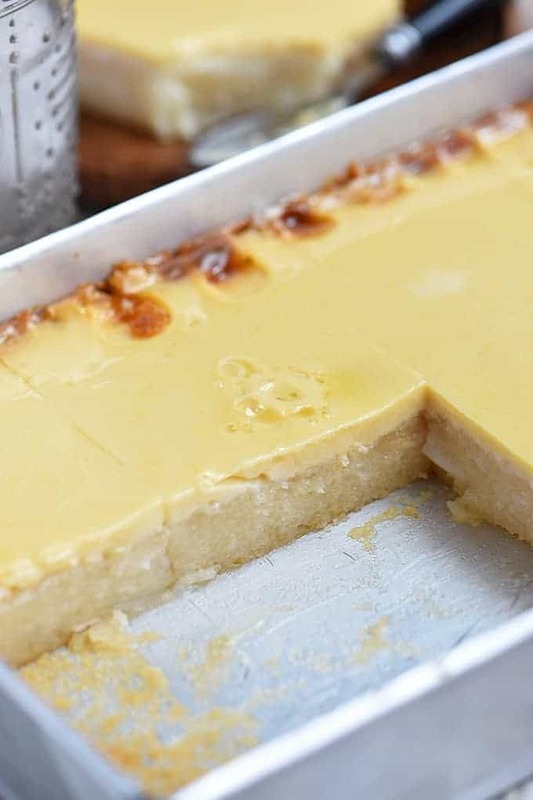 Hi Ms. Lalaine….I used to make a cassava cake but not with the custard topping but one of my friend wanted one with this topping so I googled and found this recipe of yours. I tried it and it was a success. From now on, this is what I am going to make…..the only thing is I change the macapuno strings to a Langka, I cut it into strips. Thank you for sharing your recipes. I will try the mini egg pies one of these days. It was my first time making the Cassava with custard filling and I was very pleased with the results! It was so yummy! I never attempted to make it before because I thought that it was hard to make, and I am very glad that I did it! Thanks for this delicious recipe of yours! Hi there! I’d like to try your recipe for my blog where I use ingredients I’ve never tried. I did some reading about cassava, and it says to take care to cook it because of toxins. If I have fresh cassava rather than the frozen grated stuff you used, can I just grate it and follow your recipe, or do I need to pre-steam it? Thanks!! Can’t wait to try this! I will try definitely try this as my 2yo son loves antive cakes! Hi! My coworker made your recipe and brought the cake to our Christmas party last year…but she omitted the sugar in the cassava and it still tasted so good and delicious…not too sweet! Everybody loved it and gobbled every single morsels left!! My question, what size baking pan do you use for this? Thanks! I use 11 x 7 x 2 size rectangular pan. I want to make this! This might be the first recipe for cassava cake I’ve seen though without eggs in the actual cake. You have them in the custard topping. How much difference does it make with and without the eggs? Hi, thanks for the cassava cake recipe. Planning to try your recipe but I have a question on the ingredients. Is the sugar needed for the cassava mixture? I did not see it mentioned in the instructions when combining the ingredients. No, after you mix together the egg yolks, condensed milk and evaporated milk, pour the liquid mixture on top of cake and return to oven to cook for a few more minutes until the custard sets and lightly browns. I am so sorry for the confusion. Hi Ms. Lalaine! Is it possible to substitute buko pandan instead macapuno? Thank you. Im gonna make this recipe tomorrow for the Despidida party..
Buko pandan is a flavoring and I won’t suggest using it in this cassava cake. I am afraid it will change the color to green instead of a nice golden yellow. Macapuno are shredded coconut sport, if you don’t have them, just omit and the cassava cake will be fine. Haha sorry for the stupid question! I’m always confused about buko pandan and macapuno.. Thanks for the immediate response, Lalaine. I’m gonna bake this recipe today with macapuno of course.